The back of the Historic Common Pleas Court room stands empty, as the original seats to the courthouse have been removed for restoration. 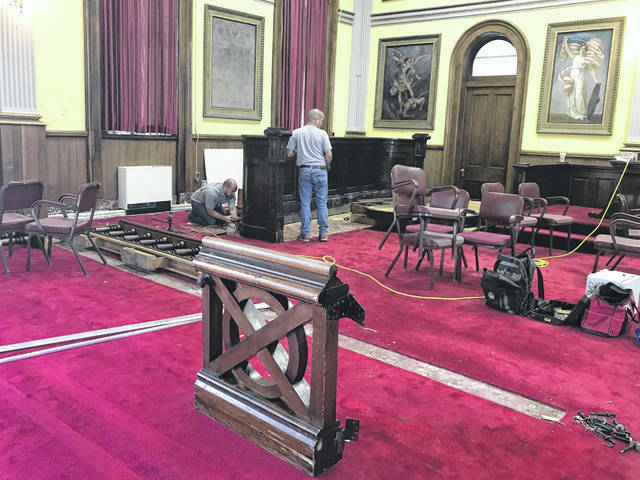 The last piece of the original “bar” stands in the forefront, as crews from Stull Woodworks, Inc. of Troy, Ohio disassemble the jury box in the Historic Common Pleas Courtroom. For the first time in over 145 years, the Fulton County Courthouse is nearly empty as it is being prepared for its historic renovation. During their regular session last week, the Fulton County Commissioners awarded a bid to Mosser Construction of Fremont, Ohio for $3,864,000 for this renovation. Pre-construction began Monday with crews working to remove the judge’s bench, courtroom seating, jury box and photos on the walls that are able to be removed for safeguarding and restoration. Renovations are anticipated to take approximately 10 months and will include historic restoration of the Common Pleas Courtroom, replacement of the heating and cooling systems, addition of security and technology features, installation of a new ADA compliant elevator and updates to the Clerk of Courts, Probate and Juvenile courtroom and offices. Funding for the project will come from capital improvement funds, special accounts and from two separate grants from the Ohio Supreme Court for technology totaling $122,080. There will be no bond issue or borrowing. As of Monday, the offices of the Common Pleas Court, Magistrate’s Court and the Clerk of Courts are operating out of the Fulton County Administration Building at 152 S. Fulton St., Wauseon. The Probate and Juvenile Courts and Northwest Ohio Court Mediation have moved to 7320 State Route 108, Wauseon, next to George’s Radio and Antenna Service. The Fulton County Courthouse was constructed and completed in 1872. The Common Pleas Court, Clerk of Courts Legal Division and the Probate and Juvenile Courts all operate out of this Fulton County landmark. 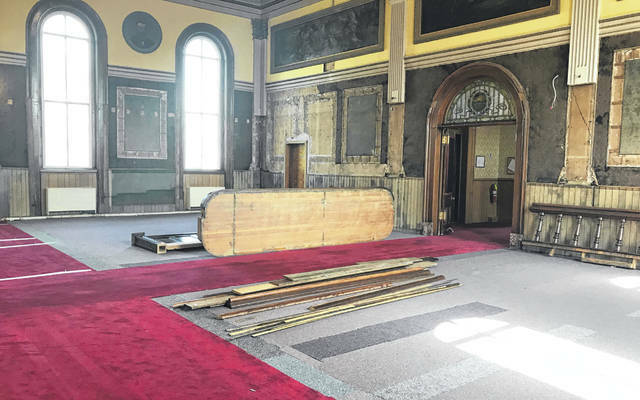 https://www.swantonenterprise.com/wp-content/uploads/sites/23/2018/10/web1_Back-of-courtroom.jpgThe back of the Historic Common Pleas Court room stands empty, as the original seats to the courthouse have been removed for restoration.